With December upon us we have much to talk about on the TechWyse hot stove. Not only was there a great deal going on in the internet marketing world in November, there has also been a lot to talk about at TechWyse itself. Given that we have recently begun sending our subscribers a weekly internet marketing update the structure of our own monthly update is going to change slightly as well. While our weekly edition will not cover much of the most recent and pressing news in the industry our monthly update will now focus more on high level business related news and will also show our subscriber some of the latest website launches from the month. We would like to remind anyone that is not receiving our weekly update to please email us (if you are a client) or sign up for our daily feedburner update here. Another month completed and another long list of happy clients signed up for WHICHABAM! Email Marketing. If you are looking to drip market a list of existing clients and/or sales prospects we encourage people to visit our email marketing website to learn how you can deliver email marketing safely, and measure the effectiveness of your campaigns. If you know us at TechWyse, you know we like to measure everything! WHICHABAM! is as good as it gets in terms of ease of use, features and reporting metrics. Visit the website now to get started. For those looking to get a hold of us over the holidays here is our holiday schedule. 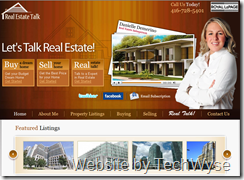 The TechWyse management office located in Toronto, Canada will be away December 24, @ 1.30pm EST until January 4 @ 9am. As a courtesy all management will be accessible throughout the holiday via email but we do ask that correspondence be kept to emergency level. Our production centre will remain open through the holiday season performing all web development and internet marketing activities. We have responded to the demand of our subscribers. We now offer a greet deal of information in our ?Week At a Glance? email. If you are not receiving this in your email each week you should tell us and we will add you! November proved to be our busiest site launch month in history. 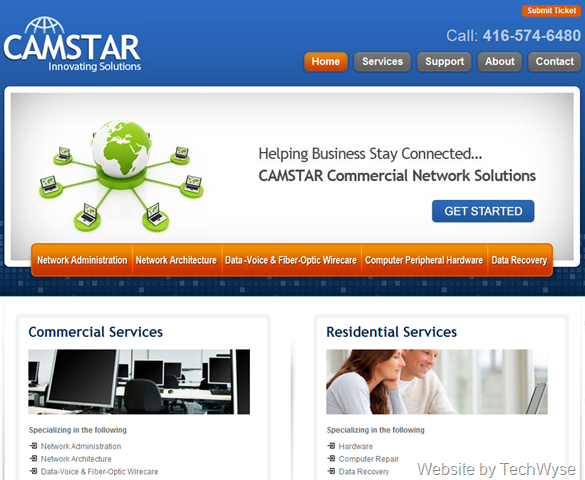 Here is just a small sample of some of our conversion friendly website development launches. If you live in the Toronto area you may have seen this retail clothing outlet. This project was exclusively built to establish the Denim 101 brand and appeal to the visitor interested in trendy fashion. 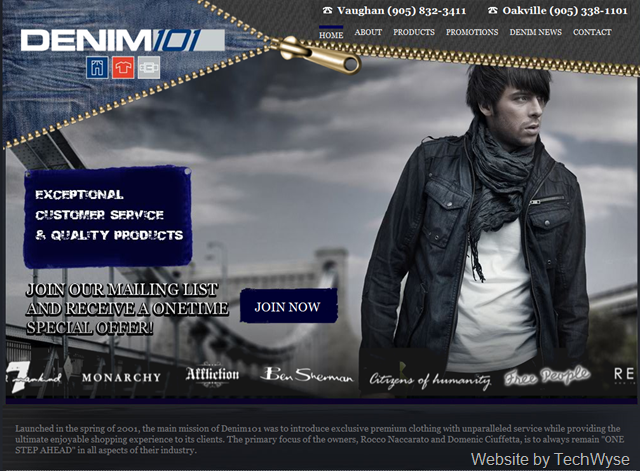 The site goal is newsletter signups and features a cool flash enhancement at site load accenting the Denim 101 brand. Have a look for the cool zipper! To learn more about this project visit the TechWyse portfolio page. 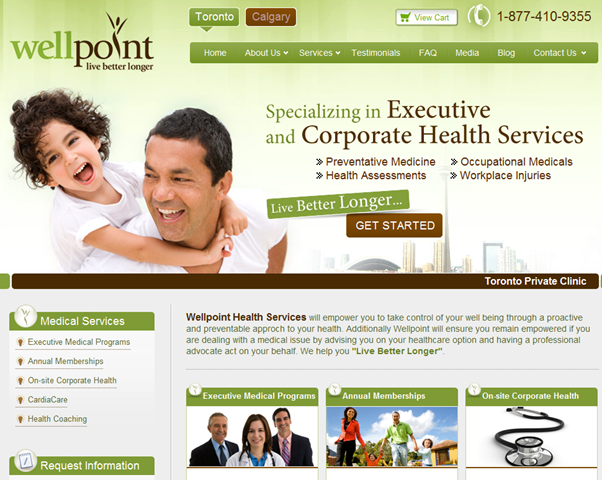 Catering to executive health clients in both Toronto and Calgary the WellPoint project presented us with some unique strategic decisions. Since the company has 2 locations that deliver very different services to their geographic region, we needed to develop a site which communicated the unique service offerings of each location but presented the visitor with clean, united corporate appeal. The result is a consistent website map highlighting the unique characteristics of each location. 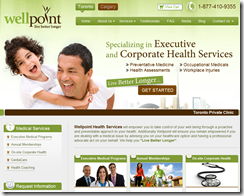 Congratulations to the team on a beautiful website development project. 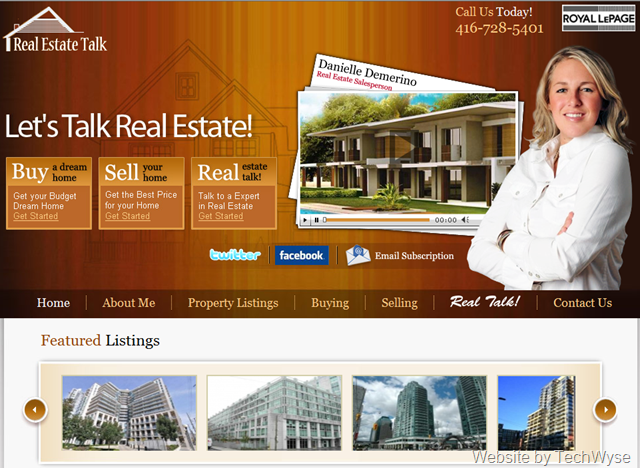 Danielle Demerino came to us with an interesting concept for a real estate agent website. She wanted us to build her a website that was highly interactive, promoted discussion and allowed her to easily manage the content on the website. We accomplished all of this by building her website with WordPress blog software. The site features all necessary SEO plugins and social media interaction. You can read more about this project on the TechWyse portfolio page. Looks pretty good doesn?t it? 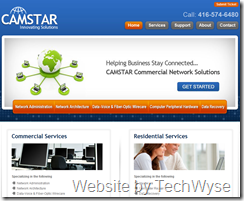 Camstar is an information technology company. The project presented us with some interesting strategic decisions. The company offers different services for its commercial and residential client base and the site needed to quickly drive home this message in order to retain the visitors that come to the site. Our decision was to use a fresh flash banner which clearly described these different service offerings. We also integrated the site with osTicket software. We have seen a tremendous improvement in bounce rate and time on site since the site was launched. On behalf of everyone at TechWyse, I wish you a happy holiday and best wishes for the New Year! Don?t forget that you can keep following our updates by adding us on Facebook or following our updates on Twitter. Very true! 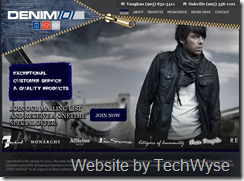 That Denim site is awesome! It can’t get done better than this. This is really a nice way to tell us about your company updates and activities. Wow! Denim101 takes my breath away! It ensembles some fantastic design thoughts. Kudos.